Organizations are highly dependent on their cloud infrastructure and deploy their maximum resources on it. Variety of services are used daily to support their day to day operations. In this situation, cloud security and performance become key areas which require maximum focus. It is necessary to make sure that some crucial steps are taken by the users which boost the security and performance of their cloud environment. In this context, RDS instance storage capacity needs to be taken care of time to time in order to maintain a minimum acceptable level of optimized performance and security. Amazon RDS (Relational Database Service) is a web service interface that allows users to set up and operate the relational database in the cloud. A DB instance is the basic building block of RDS which can contain multiple databases created by the user. RDS instance is an isolated database infrastructure in the cloud. One RDS instance containing multiple databases created by the users can be accessed using the same tools that are used with stand-alone database instances. It becomes important to monitor storage capacity of RDS database instance. If the database gets allocated to a certain limit, there are some chances of performance hiccups in query processing. Insufficient disk space in database instance affects throughput and performance which can be clearly observed in its daily operations in your cloud infrastructure. Centilytics has a dedicated insight which displays the status regarding storage capacity of your RDS database instances for the user to take note of the same and act on it immediately. How does Centilytics come into the picture? 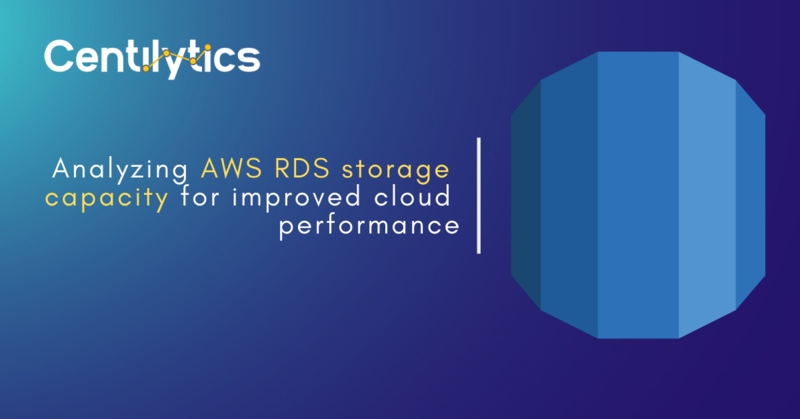 Centilytics provides insight on AWS RDS free storage space which helps users in determining the storage space available in your databases in AWS. WARNING This indication will be displayed when the database has less than 10% of free space i.e. occupied capacity is more than 90%. Region: This column shows the region in which the corresponding RDS instance exists. DB Name: This column shows the name of the database attached to the corresponding RDS instance. DB Instance class: This column shows the category or type of database instance. Resource Tags Applying resource tags filter will display those resources which have been assigned the selected resource tag. For e.g.- If the user has tagged some resource by a tag named environment, then selecting an environment from the resource tags filter will display all the data accordingly. Previous articleWhy AWS RDS transparent data encryption is important? Next articleWhy Amazon VPC outbound traffic needs to be restricted?